This page contains knives I have made as well as links to some of the best knifemakers (with computers) that I know of. The folder is a split-liner design (formerly known as a liner-lock before Michael Walker patented the term). It is an unusual design that combines elements from the normal split-liner design with elements from the traditional lockback so that you don't have to get your fingers in the way to unlock it. I used ATS34, stainless body, and kingwood scales. The paring knife is about 6" long, and is made from 440C, with tulipwood, and with brass, silver, and coloured epoxy handle pins. The miniature is 1 1/8" overall with 1090 blade, sterling fittings, and lapis lazuli spacers. This melon scoop was made for a couple that make delicious fruit-filled crepes at the farmer's market. It is forged and anodized 6AL4V titanium with tulipwood handle and sharpened bowl. And the occasional shop-tool as I need them. From the left, a (partially disassembled for scanning)knife-edge scribe - it marks the grind lines as an aid for grinding a knife blade's cutting edge. Next, a pair of engraving tools that I can't use very well, and finally, the inside calipers. I have also made ceramics scapers, pin spinners, and whatnot for people. I'll be adding more as my photography and scanner skills improve. Thanks Dwayne and James for the advice on scanning them in - big improvement. For now, drool over these people's work. They are much more talented and experienced than I am. There are many excellent knife related links on the web, and it would be folly to try to list all of them, so here's just a few. Custom Handmade Knives by Dwayne Dushane features some pictures of his work (some pretty knives (which are not being held by naked women :-}), some bio , and links to other knifemakers. Blades 'N' Stuff - 1019 E. Palmer Ave, Glendale, CA 91205 - (818)956-5110 Bob Egnath's shop caters to knifemaking novices. His catalog is at least 2/3 helpful information that is hard to find elsewhere. Many experienced crafstmen find it just as helpful. Learn unique knifemaker terminology like "organic steadyrest".This site gives you an idea of what I'm talking about. Order one now! Scott Hardy's homepage features some pictures of his work, other knifemakers' work, and links to other knifemakers. James Mattis' Handmade Knives features some beautiful and unusual fixed-blade designs,and a unique philosophy and sense of humour. 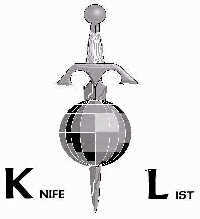 International Knife Directory features links to custom knifemakers, factories, etc. He even has classified ads! Handmade Custom Knives by Johnny Stout features beautiful folders (I'm jealous), a few fixed blades, and many links. Wayne Goddard Handmade Knives Wayne writes two monthly columns in Blade magazine. His Q&A article is the first thing I read when my subscription comes in. Judging by the picture on his page, he is as bad a housekeeper as I am, but his knives are beautiful. Like me, he primarilly does one-of-a-kind and prototype knives, however, in my case it's because I can't make two the same if I tried :-) .If you love Damascus (pattern welded) steel, this master of metallurgy has plenty to keep you happy. He also designed the Wayne Goddard Clipit for Spyderco's custom series. Knife Werks For Jerry Smith, retirement from Ohio State University meant he could go to work on knives. He is a NAFTA maker, having 2 shops, one in Canada, one in the U.S. He makes the Shark's Tooth knives which appear to be a tiny triangular thumb-dagger design (they're cute). His tantos are neat with an American-style tanto blade grind and a bolstered kitchen/camp knife-like handle. Interesting designs, a view of knives before they're finished, Kydex sheaths, and a new use for Apollo spacecraft heat-shield material. S&S Cutlery Todd Sheperd distributes this cool multitool called the Hiker's Hatchet. It's a hatchet/hammer with an 8 1/2 inch 440C blade hidden in it. The back of the blade has a saw and skinning hook. This unit is used by pilots, outdoorsmen, rescue units, and law enforcement (the New Mexico Hiway Patrol for example). According to an e-mail from Todd, they "are made by a fellow who is the armorer for a sherrifs dept. in Alburquque NM." KNIVES.COM David Kelleher's page features knives from Todd Shepperd, Damascus USA, Dawson Knives USA, Worrel Handmades, Brian Barron and Bob Egnath. This is where the images from rec.knives newsgroup are posted since you can't post them to the group. The guys in the knife-list have made, (in my case) are working on, or planning to work on a knife based on a particular drawing that George Ezel posted to the group. It was Harley's idea - a good one. Daithi's bookmarks are well organized and pracically endless. Never mind my inadequate description, just go, you won't regret it! Pat Fogarty Pat has the entire plethora of knife list postings year by year on his FTP site, and a number of good rec.knives mini-FAQ's, and a couple of knife links. Also check his Humour page to find out if you're a geek and how (not) to deal with service personnel. Does writing your HTML on a word processor instead of using a program count as geeky? He also has a news group and telnet chat. I'll definitely be spending time reading the knife FAQ's! There are many other links that I have left out, but these guys haven't. If I missed yours, drop me a line and I'll pop it in. I met most of these talented people though the knife-list which someone had told me about on alt.rec.knives. To check us out, just e-mail to majordomo@swcp.com with the command "subscribe knife-list" in the body of the message. All makers are made welcome.